Tax professionals, mortgage brokers, and everyone in the financial industry has to compute various financial functions from profit margins, loan-related expenses, cash flow calculations, investment values, and so much more. But it’s only possible with the best financial calculator. Accounting calculators are not just valuable to accountants, but they also come in handy for students taking economic classes like CPA and CFA. They perform calculations involving interest rate, tax, and profit thus saving you time. Choosing the ideal accounting calculator depends on a lot of things, and more so, on the usage. If you are a finance student, you may need different keys from someone who is crunching numbers in an accounting firm. In this article, we help you distinguish the best from the ideal accounting calculator for your needs. You don’t want to own a calculator you don’t even need. Here’s an overview of the five best accounting calculators 2019. 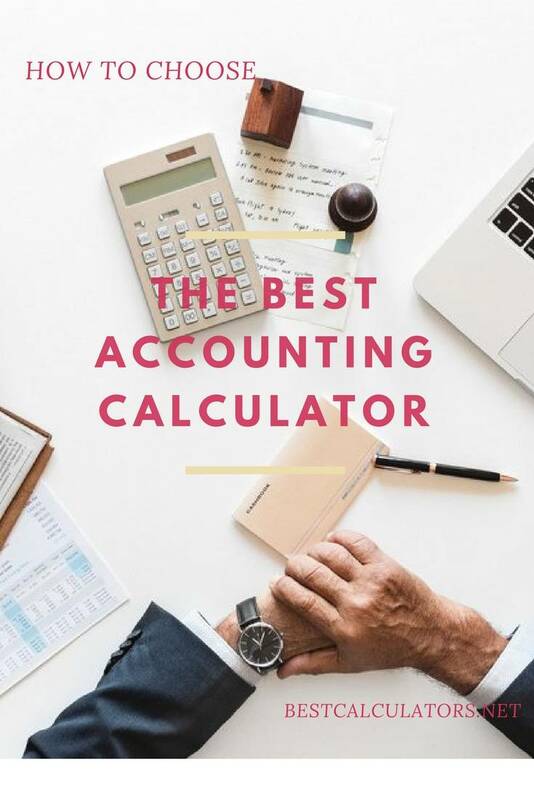 What is the Best Accounting Calculator in April, 2019? 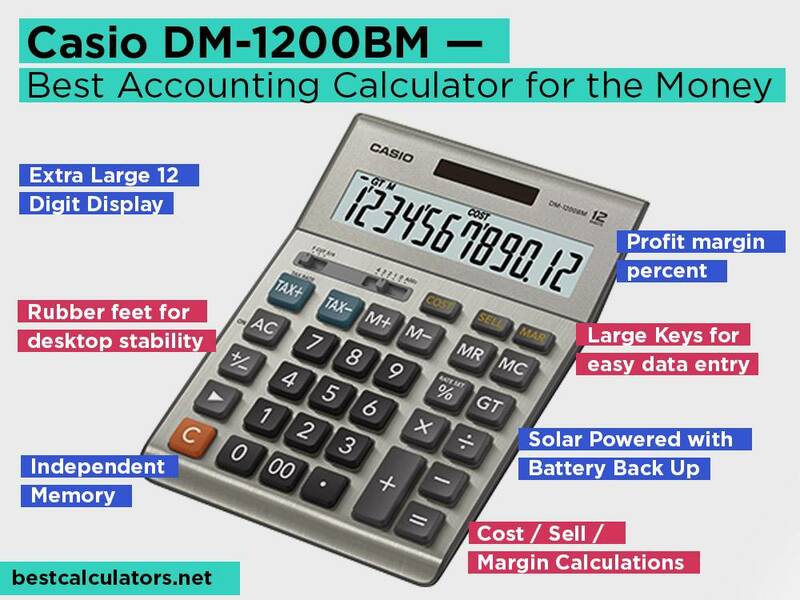 Casio DM-1200BM Large angled 12-digit LCD Tax, cost/sell/ profit margin, and profit margin % Solar and battery power ⭐️⭐️⭐️⭐️⭐️ Check our Review! 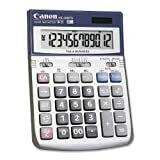 Canon HS-1200TS Large 12-digit angled LCD (shows operation and equal symbols) Cost/sell/margin, tax, square root, and memory keys Solar and battery power ⭐️⭐️⭐️⭐️⭐️ Check our Review! Helect H1006 Large 12-digit angled LCD Tax, cost/sell/ profit margin, profit margin %, square root, and currency conversion Solar and 1AA battery power ⭐️⭐️⭐️⭐️ Check our Review! 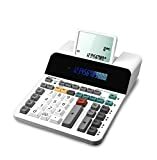 Sharp EL-1901 12-digit LCD and 5-lin tilt LCD Check and correct, profit margin, automatic tax keys, and 4-memory function AC power and battery backup for stored entries ⭐️⭐️⭐️⭐️ Check our Review! 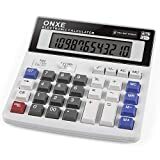 ONETWO Desktop Calculator Extra-wide 12-digit LCD Tax, square root, profit margin, and grand total Solar and battery power ⭐️⭐️⭐️⭐️ Check our Review! It’s impressive that a calculator can be in the market 30 years after its first production. Maybe it’s because of its durability, or it is its excellent battery life. Either way, HP 12C is here to stay. From actuaries to money managers, auditors, product managers, and many others, one calculator lies on their desks, and they all love it the way it is. This feature cuts the calculation time by half. It prevents double entry of sign such that if you need the answer to 5 + 7, you just type 5 Enter 7 +so you won’t use the equal sign. 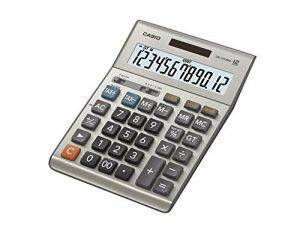 This reduces your time on the keypad thus saving you time when handling many calculations. As we say in business, time is money and a calculator that puts value in time is worth any computer app. This calculator also has an algebraic entry system with parentheses. 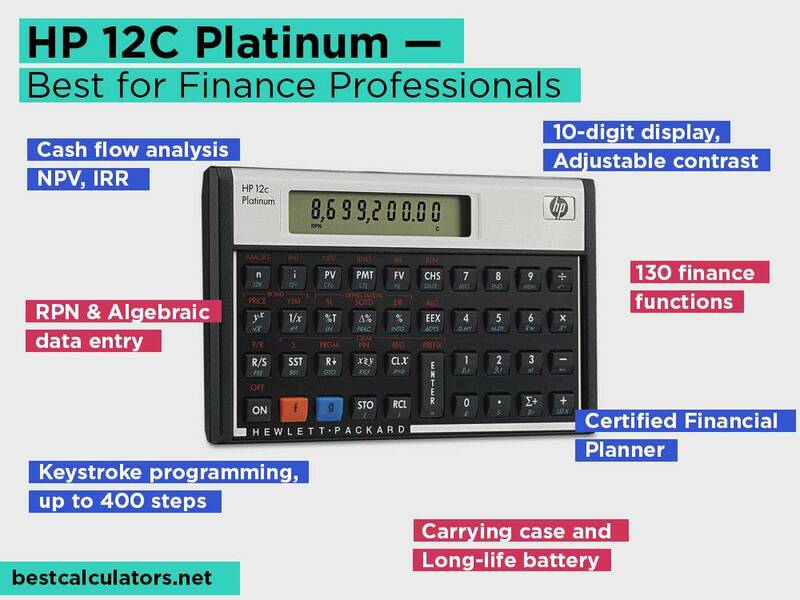 HP 12c can handle up to 80 cash flows thanks to the memory function. The same memory can handle up to 400 steps for the 130 functions. It provides you with a nice mix of finance, business, and statistics allowing you to solve all types of math problems in your sector. This includes time-value-of-money math and creation of amortization schedules with the help of NPV and IRR. It can also store your custom programs for future calculations of cumbersome problems. You have a one-line 10-digit display. It is on an adjustable contrast LCD which allows you to change the brightness to suit the exterior conditions. Being able to adjust contrast eliminates eye strain if you are in a low lit environment. It also allows you to read the results fast and smooth with a light setting that suits your eyes. One of the reasons this calculator has managed to stay in the market for so long is its shock resistance. Whether you work in the office or you spend your time in the field, you will at one time drop your calculator on the floor. If it is a concrete floor, you can end up with a cracked screen or jammed keys. But not with the HP 12C. It is rigorously tested for falls that’s why you will spot it in just about any environment. Looking at the battery life, HP 12C is powered by one CR2032 battery. It continues to provide similar long-term performance. Some users indicate they have not replaced their batteries for over a decade. It goes on to say the kind of reliability you can only get on HP 12C. It takes time to learn and master using this calculator, but there is an online training program. Once you get past the basic level, every other function is a breeze to learn. This model can solve both basic and financial math. It has an inbuilt memory for storing essential functions. With it, you can use the worksheet mode which has tables for amortization schedules depreciation, bond, and compound interest. It can also perform cash flow analysis as well as list-based statistics. Casio is known as one of the most revolutionary companies when it comes to making the best calculators for the money. 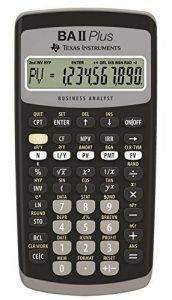 The DM-1200BM is an ideal pick when you want a calculator for personal finances, in the office, or when you are running a small business. Casio DM-1200BM is a simple 12-digit display calculator with only the necessary functions. It is lightweight, portable, and it can comfortably fit in small desktop spaces. The first thing you notice about this calculator is that it feels stable on the hands. It uses a sturdy plastic and metal faceplate with large keys. You’ll be able to input numbers as you carry out quick calculations. You’ll like that the screen sits at a nice angle which makes it effortless to see even from 3ft away. The numbers on display also appear large as they seem to be as big as 3/8 of an inch. This allows sharing of input with others since no one will confuse one number for another. The numbers even have a nice contrast against the LCD thus you can read them fast and easy. Balancing taxes and profit has been made straightforward using the TAX and Cost/Sell/Profit keys. The TAX key performs automatic calculations of discount, price less tax, price plus tax, tax amount, selling price, margin amount, and discount amount. The Cost/Sell/Margin calculates selling price, cost, or profit margin of an item given the other two values. You can keep your accounting books in order with the help of this calculator. With enough light, this calculator functions by using solar energy. When it’s dark, battery power kicks in to provide sufficient energy to perform calculations after dark. We don’t ever see you replacing the batteries on this calculator. The Casio DM-1200BM looks and feels solid. It is sturdy and ready to use when you are. If you want a business-oriented calculator, we feel the Canon HS-1200TS makes an excellent pick. It is a desktop calculator that ticks all the right boxes when it comes to business functionality. The ergonomic design alongside the angled view optimizes viewing comfort for daily use. The keys on this calculator are large and easy to press. They are also designed to prevent accidental pressing when you brush over them. The characters appear large on the display making it possible for everyone to read and recognize results from a distance. If you don’t have the best eyesight maybe because of age, the Canon HS-1200TS will provide the convenience of viewing without stressing the eyes. The LCD shows the operation symbols and equals sign meaning you’ll know when the result is being displayed. It is instrumental in busy businesses where disruptions are a common occurrence. This calculator provides exceptional functionality by performing tax computations and cost/sell/margin calculations. It offers diversified use whether in the office, home, or school. It offers sign change, grand total, square root functions, and round off/down keys. It also lets you toggle with the input to get the desired results. The large keyboard feels more like a laptop keyboard. It allows you to input numbers with minimal errors. The memory function saves long steps meaning you can input a series of complex numbers and get results much faster. The percentage key also increases the functionality of this calculator. 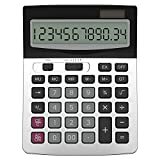 When you need to perform mundane calculations, add debit and credit, this calculator is all you’ll ever need. It has an advantage over other models as it is incredibly faster and it carries far less weight than other business calculators. This calculator provides both solar and battery power operations. It’s not like you’ll ever take it out to bask under the sun, but as long as some rays are coming through the window, your calculator will work efficiently. Casio brings us a simple handheld calculator that you can take anywhere. It is incredible in terms of the added functions like memory keys. It is an attractive blue and silver metallic design that is impact resistant. 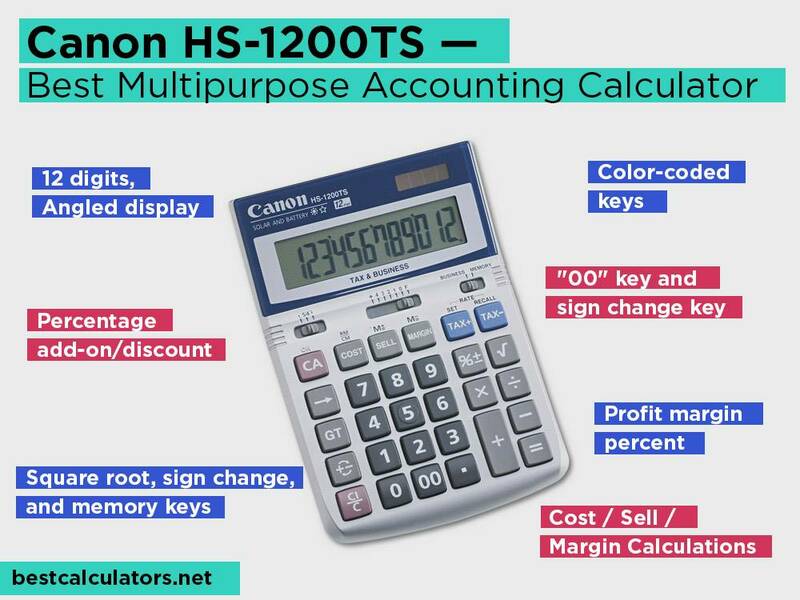 For the price, Canon HS-1200TS is a superior accountant calculator. Here’s a calculator that works right out of the box. The black and silver detailing on the Helect H1006 makes it an attractive model. It will fit in any office as it provides the functions that an accountant needs. 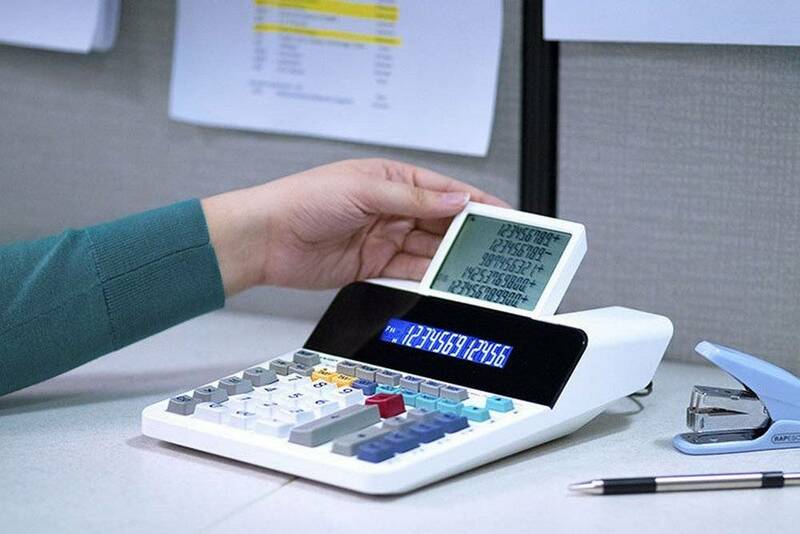 Just like other office calculators, this model features an angled display which prevents squinting of the eyes when reading the results. We start with the large color-coded menu. It is easy to punch numbers as they feel like working on your PC. They have a springy feel which lets you know when you input a number. This is a slim, elegant design which sits without bouncing up and down when hurrying through numbers. You’ll like that it exempts you from having to use your Windows calculator especially if you have large hands. 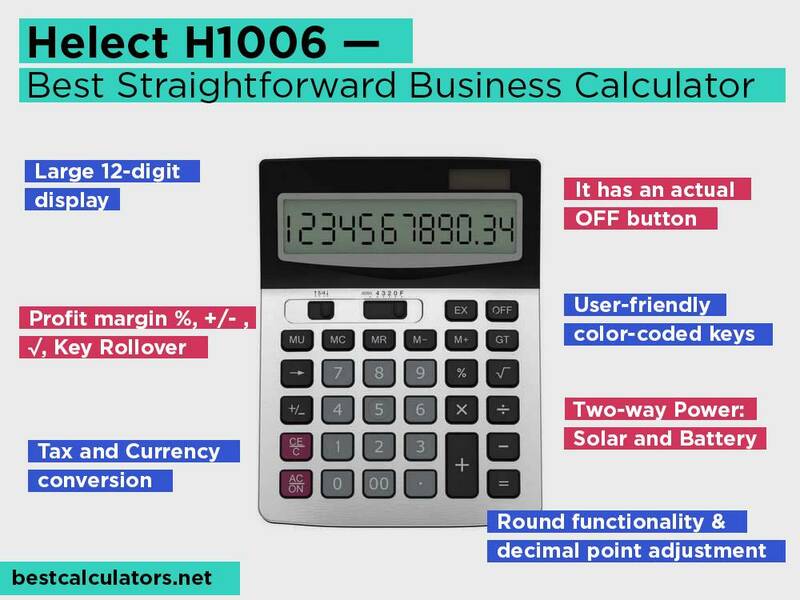 With the help of this calculator, you’ll be able to calculate profit margin, compute tax, and perform currency conversions. It has standard functions like percentage, square root, grand total, and roundup off/down. You can still do basic math and even use it for personal finances. When we say it works right out of the box, we are referring to the fact that it relies on solar energy to perform its operations. You are also provided with a battery slot where you can input 1AA battery for backup purposes. From quality, to ease of use, and functionality, the Helect H1006 is another invaluable business tool. Business accounting will no longer feel like the boring stuff you have to do for your business to thrive. 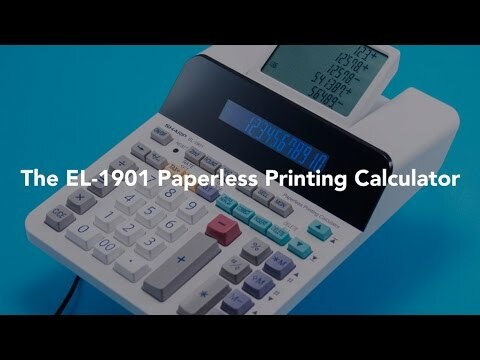 Sharp introduces the EL-1901 12-digit paperless printing calculator. This model is ideal if you need the traditional functions of a printing calculator without having printed paper records. It is a powerful design which provides up to 300 lines of digital results. This calculator has a 5-line LCD. On it, you can store up to 300 entries in the memory. You can edit the entries, recalculate and modify the results using the check and correct function. It lets you scroll up and down the 300 lines so that you can refer back to previous calculations. This way, you can keep updating your entries when need be. The check and correct function is in the teal keys. 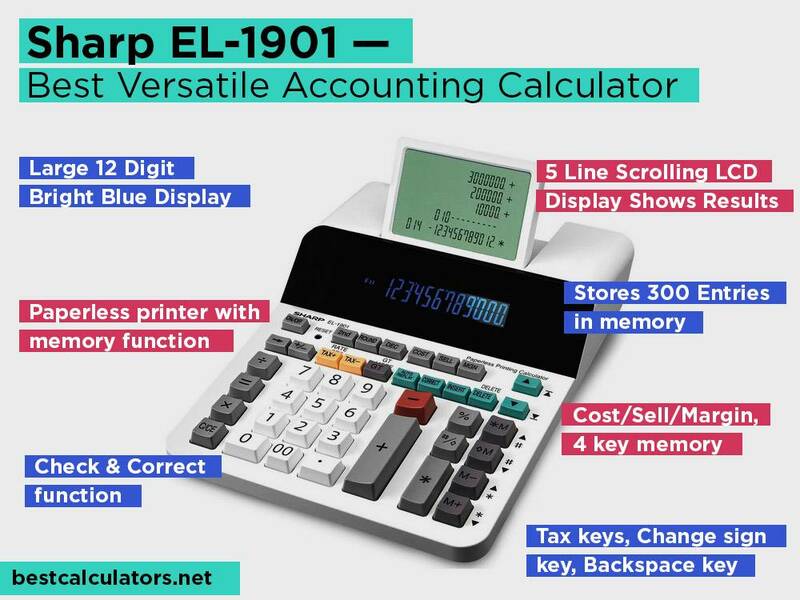 The Sharp EL-1901 comes with automatic keys for business accounts calculations. You can get the profit margin using the cost/sell/margin keys which allows inputting two variables to get the third variable. It also has tax keys, grand total, four-memory keys, and many more to facilitate everyday business calculations. The primary display is a 12-digit angled LCD. It is complemented by a tilting LCD which allows simple scrolling through the 5-line entries. It does not require any paper to store calculations. You’ll no longer be dealing with ink, paper rolls, and messy receipts. If you are environmentally conscious but still need a sleek calculator with a memory function, Sharp EL-1901 comes to suit your needs. What’s more, this model boasts whisper-quiet operation which makes it ideal for office use. You can carry out office duties without talking over a printer’s noise. You’ll also love that it has a full-size keyboard for fast entries. Not all calculators are an anachronism as you can tell by the innovative design of the Sharp EL-1901. This model brings far more functionality in an accountant calculator. It can store up to 300 editable calculations thus providing flexibility of keeping records and updating entries. The ONETWO Desktop Calculator spans its use from the office to the classroom. It is a high-quality calculator that has been tested to meet the standards of heavy everyday usage. It can punch numbers all day, and the keyboard will never stick. The company has already subjected it to a test try of 100,000 times tapping. The extra-large 12-digit display is on a tilted screen. The numbers occupy the width of the LCD so that anyone can read the results comfortably. Whether you are in your senior years or are a student who needs a financial calculator, you’ll like the percussion keyboard as you can feel each of the keys as you press down. It eliminates instances of double entries so that you can complete work with no errors. Calculate common accounting math from tax amount to percentage, profit margin, and square root with the help of this calculator. This model is designed to handle standard functions. You’ll not be able to tackle statistical math and the like. But we like that it is fast in that it delivers immediate answers even when you feed it with numerous entries. With a solar battery or one AA battery, you are good to use this calculator in different environments. It proves dependability when you need a device to take to remote areas. The portable size is a remarkable feature as it does not restrict its use to just one location. 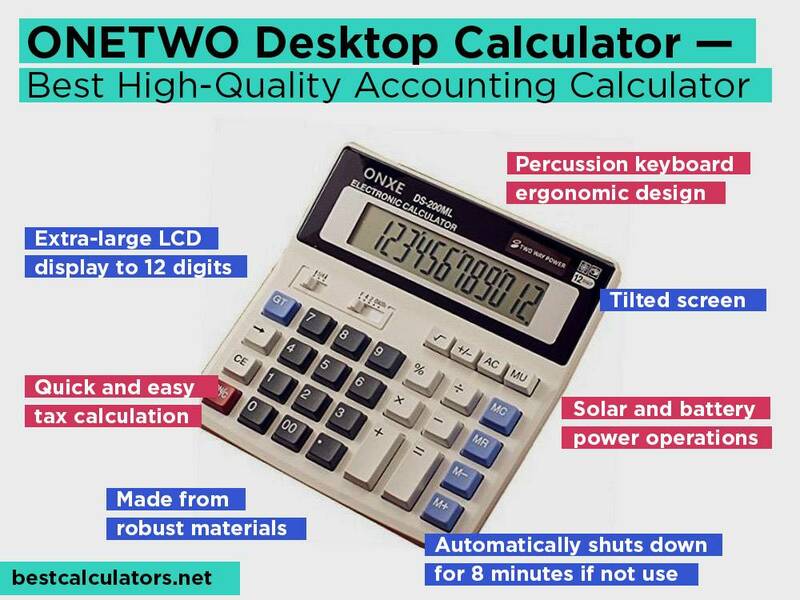 The ONETWO Desktop calculator is a handheld device that makes it easy for accountants and students to perform computations that would waste of time or uncomplicated. It is also affordably priced for a model that comes in high-quality design. An accounting calculator is always a valuable investment. Here are some notes to remember as you choose an accounting calculator for your needs. Geared towards finance problems. 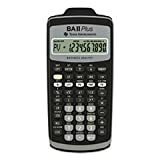 Apart from the basic math computations, these calculators also have additional features that help to solve financial problems. These can be such problems involving tax computations, discounted cash flows, interest rates, etc. They are affordable. Accounting calculators do not have to carry complex functions like graphing capabilities. This brings down their cost which is ideal when you want to run a profitable business without investing heavily in equipment. Easy to Use. 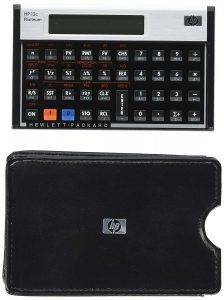 The menus and display of these calculators are straightforward to use and see. They have color-coded keys with large LCDs where entries include the operation symbol. You’ll be able to get accurate answers instead of writing down numbers and doing the calculations in your head. Portable Designs. These calculators are generally compact. You’ll not have to invest in many pieces if you need to use one in the office and another at home. This is because they can easily be carried to different locations. Over-dependence on calculators including accounting ones seems to be a problem that spans throughout all sectors. Using a calculator for all your calculations can create embarrassing situations where you are unable to solve simple math without a calculator. How do you use an Accounting Calculator? Using an accounting calculator is incredibly simplified when you follow its instructions. Most of the keys are color-coded to allow memorizing of where specific functions are dialed in. Accounting keys like Margin, TAX, Currency Conversion, and Cost/Sell are found on the upper side of the calculator. White keys in many calculators represent the primary functions while the other colors blue/green indicates alternative functions. How to Clear an Accounting Calculator? If your calculator does not have any stored entries, pressing the C button will clear the operation in progress. The CE key clears the screen but will not clear entries stored in the calculator’s memory. The MC clears anything stored in memory. How do you set the tax rate on an accounting calculator? If you do work that constantly involves inputting tax rates, it will require that you know how to apply the current tax rate to save time and keystrokes. Does size matter? Your accounting calculator will be used on a daily basis. It is imperative that it is the right size for easy carrying around. It should also feel sturdy in your hands. You don’t want to keep dropping it if it’s too large. 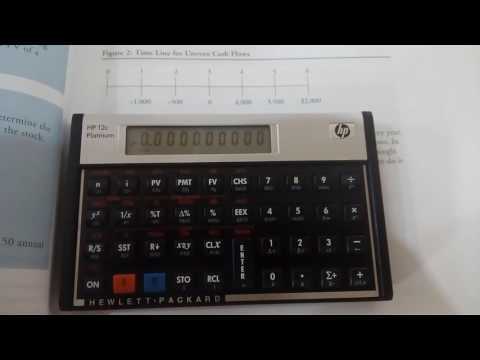 Accounting Present and Future Value Calculator. These are financial calculators that allow you to enter values for calculating money problems involving time. They are useful when computing investment problems like how much money you’ll have in the bank after five years at the current interest rate. The calculator allows you to compute the answer by inputting the different terms. Book Value Accounting Calculators. Book value is the current value of a company after taking into account depreciation of assets and liabilities. This value appears in balance sheets but has to be computed in a series of actions. Book value calculations are provided by computer programs more so in Excel. Margin Calculator. These are important calculators associated with Forex trading. They are trading tools that help compute the currency value since currencies come in pairs. They help users determine the course of action regarding their investment. The question to use accounting calculators or Excel is always a debate. Accounting calculators are very easy to navigate. They are very handy as they are small and portable. It’s not like finding room for your laptop when going to work every day. An accounting calculator is excellent only to a certain degree. If you work in a busy accounting firm, you’ll find yourself using both Excel and your financial calculator. Excel sheets save time when you have to analyze books of large organizations. These spreadsheets automate calculations, simplify tasks, and improve accuracy levels. Excel spreadsheets are indispensable for budgeting, data entry, and financial forecasting. An accounting calculator cannot take the place of Excel spreadsheets, but Excel can take over the work of an accounting calculator. Only that, performing simple calculations is better on an accounting calculator. Accounting calculators are crafted to handle financial functions. The question about which model works great comes down to your budget and preference. 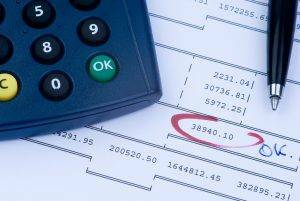 The accounting calculators on our list are beneficial to accountants, actuaries, business workers, and individuals who need help with their finances. If you are looking for an accounting calculator on a budget, or you are content with a paperless printing model, you’ll find our models satisfactory. Here, you’ll get a calculator that can help you be better in money matters. After all, we interact with money every day.